Back by popular demand: David Sedaris’ perfect antidote to holiday madness. For those who like a little jeer with their Christmas cheer, “The Santaland Diaries” offers Crumpet, a 33-year-old starving artist turned Macy’s elf. It’s the most wonderful time of the year, but who would know it from the bad Santas, naughty elves, cranky kids, and pushy parents who test Crumpet’s last elfin nerve. With sardonic wit, Sedaris takes us all playfully to task for plunging into the Christmas spirit while missing the point. This is for mature elves only. “The Santaland Diaries” performs Dec. 9-Jan. 3 in the Storch Theatre at the Syracuse Stage/Drama Complex, 820 E. Genesee St. The opening night performance is Friday, Dec. 11, at 7:30 p.m. Tickets and information are available at http://www.syracusestage.org, by phone at 315-443-3275, or in person at the Syracuse Stage Box Office (Monday-Friday, 10 a.m.-6 p.m. and two hours before the show). Discounts are available for groups of 10 or more at 315-443-9844. Discounts are also available for seniors, students and U.S military personnel and veterans. Sign interpretation, open captioning and audio description services are available for select performances. 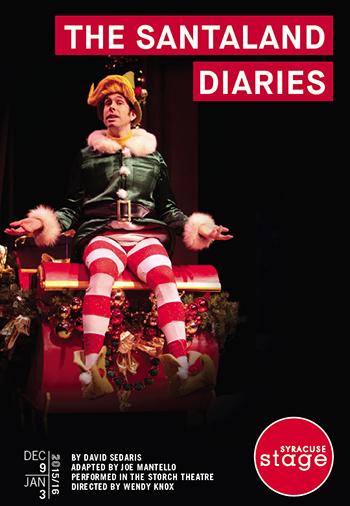 In 2008, Syracuse Stage presented “The Santaland Diaries” as a stage adaptation by Tony Award-winning director Joe Mantello. Director Wendy Knox and Wade McCollum as Crumpet the Macy’s elf return for a repeat engagement, bringing back the familiar skewered holiday humor that made the initial production so popular. “Sedaris sees an everyday event and spins it into words in a way that is so delightful. He can pick up a detail and assign it a meaning and it just becomes so funny,” says Knox. Considered a master of satire, Sedaris writes “The Santaland Diaries” with sarcastic humor and cultural commentary, but with clear intent to illuminate how, in the rush of the holiday season, we overlook what is truly important. Sedaris is the award-winning author of nine books of essays. His plays have been produced at La Mama Experimental Theatre Club, Lincoln Center, and the Drama Department in New York City. These plays include, “Stump the Host;” “Stitches;” “One Woman Shoe;” which received an Obie Award; and “The Book of Liz,” published by the Dramatists Play Service. He was also nominated for Best Spoken Word and Best Comedy Album for his original radio pieces on “This American Life.” In 2001, Sedaris became the third recipient of the Thurber Prize for American Humor, and was named Time magazine’s humorist of the year. The hilarity of “The Santaland Diaries” has made it a holiday favorite since Sedaris’ first script reading, hosted on NPR’s “Morning Edition” in 1992. Knox noted that it has become so popular because of the show’s welcome comedic relief in a season overrun with distraught parents, crying children and consumerism.